Visit Scotland and enjoy some of the best golf courses. Here you can find out all about the game, the history and traditions. Day 1: Arrival to Glasgow airport. Here you will be met by local representative and will be transferred by minibus to your hotel - Marine Hotel. Chek-in. Free time to relax after flight. Overnight. Round on Royal Troon Golf Course. Overnight. Round on Dundonald Links Golf Course. Overnight. Round on Old Prestwick Golf Course. Visit of Culzean Castle. Free time. Overnight. Round on Western Gailes Golf Course. Free time. Overnight. The sequence of golf courses and visit to the castle can be changed. The final program will be specified according to the travel dates. Royal Troon Golf Club is a links golf course located in Troon, South Ayrshire, Scotland. The club was founded in 1878, initially with five holes. George Strath was appointed in 1881 as the club's first golf professional. The club was granted its "Royal" accolade in 1978, during its centennial. Its Old Course is one of the host courses for The Open Championship, one of the major championships on the PGA Tour and European Tour. The Club has hosted the Open eight times, last in 2004, won by Todd Hamilton in a 4-hole playoff against Ernie Els. It is scheduled to host again in 2016. Royal Troon is home to both the longest and shortest holes in Open Championship golf. The par-3 8th hole ("Postage Stamp") measures a short 123 yards (112 m) and is regarded as one of the top holes in the world, while the par-5 6th ("Turnberry") extends to 601 yards (550 m). Western Gailes Golf Club, founded in 1897, is situated on the Ayrshire coast of Scotland where many of the finest Scottish golf links are located and is only 4 miles from Glasgow Prestwick International Airport. It is recognised as one of the finest and true links courses in Scotland measuring 6899 yards from the championship tees. The course has played host to the Curtis Cup, PGA Championship, Seniors and prestigious Scottish Amateur Championship. It is also one of the final qualifying courses when The Open is played at Turnberry or Royal Troon. The clubhouse, with its view of the hills of Arran and the sharp outline of Ailsa Craig standing out from the shimmering sea, gives an instant picture of the delights Western provides and the comforts it affords to all who visit us. The reputation of Western Gailes as one of the game's finest and more exacting courses has spread world wide, as evidenced by its numerous visitors. In February 2003, Loch Lomond Golf Club acquired a new links course near the legendary town of Troon in Ayrshire. It was intended to not only enhance the Club’s prominence within international circles but also to provide its esteemed international membership with a challenging alternative links venue. Designed by the highly acclaimed golf course architect Kyle Phillips, also renowned in the UK for Kingsbarns and The Grove, the 7,100-yard, par 72 course was inspired by the timeless architecture of the great Ayrshire links courses of Royal Troon, Prestwick and Western Gailes, all connected by the historic rail line. At the time of purchase, the course was known as Southern Gailes and it has since been renamed ‘Dundonald Links’ to reflect the history of the site. Dundonald means ‘Fort Donald’ and there is a hill near the course upon which fortifications have been located dating back to the period 500 through 200 B.C. Three castles succeeded the original structures and in the early 1900s there was an old golf course named Dundonald on the site of the new course. It was converted to military use during World War II, at which time it was known as Dundonald Camp, and was used to rehearse the D Day landings. 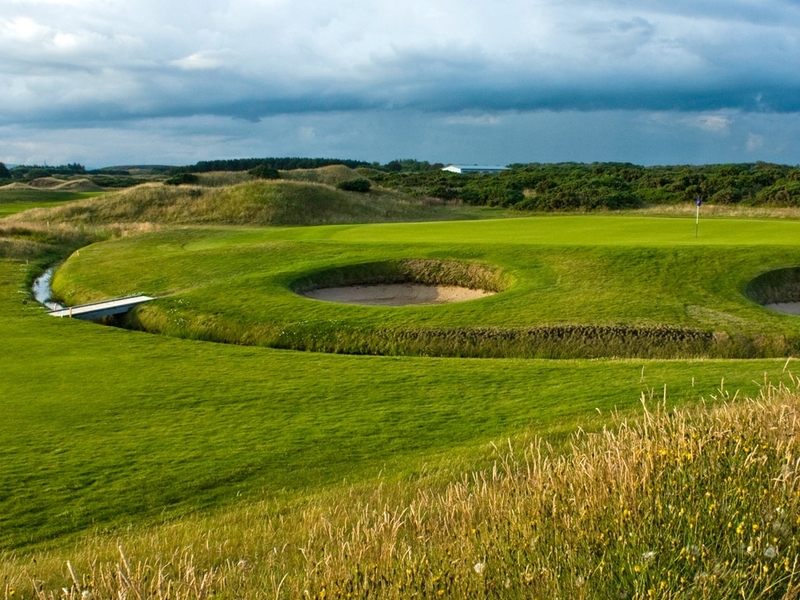 Dundonald Links has become recognised as one of Europe’s “must play” links courses. It has played host to a number of professional and amateur tournaments, including pre-qualifying for the European Tour and the Senior British Open Championship. The course is open to visitor play and Membership opportunities are available. The 4-star Marine Hotel is a grand building with magnificent views over the Firth of Clyde towards the Isle of Arran, overlooking Royal Troon Golf Course. The hotel boasts a wealth of leisure and fitness facilities, including a modern fitness suite, sauna, spa bath, steam room, indoor pool and beauty salon. With stunning views out to sea, The Marine Hotel's restaurant hosts 'Two Fat Ladies at The Marine'. It is open daily, for breakfast, lunch and dinner. Dishes are prepared using locally sourced produce. Also featuring magnificent views, The Arran Bar Lounge offers light snacks and drinks from the lounge menu throughout the day. Glasgow is just 30 minutes' drive away and Ayr is a 10-minute drive. Within a 15-minute drive, guests can reach Culzean Castle and Country Park or Robert Burn's birthplace. With 89 bedrooms, including four suites and 12 deluxe rooms, it has magnificent views over the Firth of Clyde to the Isle of Arran and is the ideal location to explore Dundonald Castle, Dean Castle Country Park and Burns Cottage. Just one mile from Troon train station and a five minute drive from Glasgow Prestwick Airport. SNGL suppl - 300 £. For 2-3 pax price is on request. Visit to the Culzean Castle (transport and entry included).